They say Baseball is as American as apple pie and hot dogs. It’s one of the few things that brings together Americans of all stripes, and fans of the game cross all demographic categories. And no matter what your political leanings (or lack thereof), I think we can all agree that the honor of throwing out the ceremonial first pitch at a game is probably one of the highest honors there is. MLB’s Opening Day was Thursday, and for the third consecutive year, President Trump did not throw out a first pitch to open the season (no matter what your feelings towards the current occupant of the White House, this article will attempt to remain politics-free), and I was disappointed. 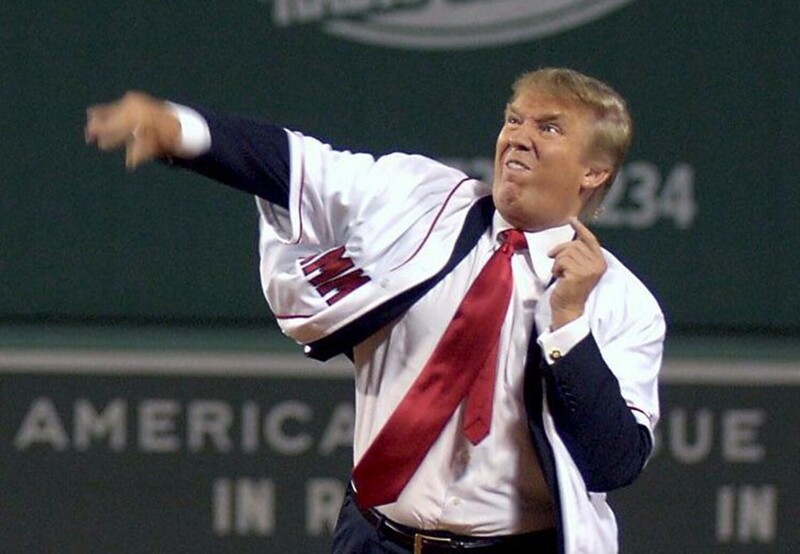 You see, the tradition of throwing out the ceremonial first pitch (whether it be to open the season, the All-Star Game, or the World Series) dates back to 1910, and every sitting President has thrown at least one during his tenure. Since President Trump’s tenure is just over two years old, there is still plenty of time for him to continue this century old tradition, and I hope he does so. On April 14, 1910, President Taft became the first President to throw out the first ball. He did so at National Park in a game between the hometown Senators versus the Philadelphia A’s. Apparently, he hadn’t even been scheduled to attend the game at all, and this great tradition was completely unplanned. (You can read more about that here.) Taft would also throw out the first pitch the following year, in 1911 — but did not in 1912, due to national mourning over the recent HMS Titanic disaster. Fun Fact: Taft was not only the first sitting president to throw out a first pitch, he was also the heaviest, tipping the scales at approximately 300 lbs. Looking at the above photo, he appeared to have pretty good form! President Wilson, proving baseball (and ceremonial first pitches) to be non-partisan (or bi-partisan), followed Taft’s tradition and threw out the first pitch in Washington on opening day in 1913. He’d end up throwing four first pitches — three on opening day — during his tenure. The above photograph was from the April 20, 1916, home opener for the Senators against the Yankees, at what was then known as Griffith Stadium. Fun Fact: On October 9, 1915, Wilson became the first President to throw out the first pitch of a World Series game (at Baker Bowl, between the Red Sox and Phillies). He did the honors before game 2 of that Series. Wilson attended a number of games during his tenure, although he didn’t always throw out the first pitch. President Harding threw out the first pitches at Senators games in 1921, 1922 and 1923 (he also attended, unanounced, the brand new Yankee Stadium in 1923). The photo above is of Harding throwing out the first pitch in 1922. He also displayed pretty good form. Fun Fact: Harding became the first President to throw out an opening day first pitch after which the Senators lost. If Coolidge’s form (shown above at the Senators Opening Day on April 15, 1924) doesn’t look all that good — although it’s obviously tough to tell from that photo — it might be because he reportedly wasn’t really a baseball fan at all. But he did recognize tradition, and knew that throwing out the first pitch was good politics and good optics. He ended up throwing out many first pitches during his Presidency, including during World Series games. Fun Fact: While President Coolidge wasn’t necessarily a fan, his wife Grace was a huge fan and was an expert scorekeeper. Hoover was reportedly a big-time baseball fan, and threw out the first pitch at each home opener for the Senators during his presidency. As a kid, he played shortstop and called baseball “the greatest of all team sports.” You can read a good article about Hoover and baseball here. Fun Fact: While Hoover may be not be remembered as a great baseball fan, one of the more famous remarks about his tenure in office involved a quote from Babe Ruth. Like Hoover, President Roosevelt was also a big baseball fan, and threw out more than his fair share of Opening Day pitches. The photo above was Roosevelt’s first first pitch, which occurred on April 12, 1933. Though afflicted with polio (and thus unable to walk without leg braces), Roosevelt didn’t always throw out the first pitch while seated. Sometimes he stood, like this one on April 24, 1934 (more here). FDR also insisted that Major League Baseball be played during the course of World War II. Fun Fact: FDR has an Opening Day record (10 first pitches) that will never be broken. At least, not unless the 22nd Amendment is repealed. 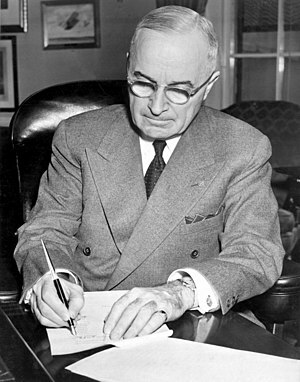 President Truman no doubt loved baseball as well. He threw out eight first pitches (including his first home opener, shown above, on April 17, 1946). He was also a southpaw. 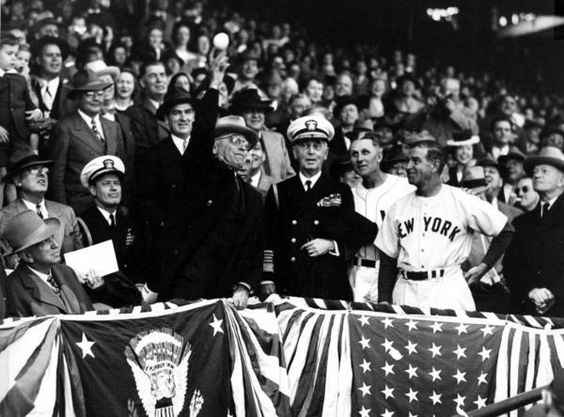 Truman attended more games than any President (though not necessarily throwing out the first pitch), but he did throw out the first pitch on September 8, 1945, shortly after the surrender of Japan, which ended World War II. You can check out his attendance at games here. President Eisenhower was probably much better known for his love of golf than baseball, but like his immediate predecessors, he attended many games and threw out seven first pitches (including during the 1955 World Series at Ebbets Field in Brooklyn). But golf was on his mind for his first home opener in 1953 (pictured above): he was playing golf at Augusta that day! But the game ended up being rained out, and he threw the first pitch at the made up game (April 16, 1953). Fun Fact: Eisenhower was the first President to wear a glove while throwing out a first pitch. JFK threw out the opening day pitches in 1961, 1962 and 1963 (his first, on April 10, 1961, is shown above). While he threw out that pitch (like many Presidents before him) in Griffith Stadium, he was the first to throw a pitch to the expansion Washington Senators — who would eventually become the Texas Rangers — as the original Washington franchise had relocated to Minnesota during the off-season. He also threw out a first pitch during the 1962 All Star Game. Fun Fact: Kennedy became the first president to throw out a first pitch at what was first called “DC Stadium,” the new facility that replaced the aging Griffith Stadium in 1962 (more here). That stadium was later renamed RFK Stadium, following the assassination of Bobby Kennedy in 1968. Fun Fact: Johnson was the first President to attend the dedication a new ballpark in 1965, when the Houston Astrodome opened. He arrived in the second inning. Although from Texas, Johnson didn’t throw out the first pitch — that honor went to Texas Governor John Connally (more here). Eisenhower and Johnson both wore baseball gloves and suits (an odd combo, no?) to throw out first pitches, a practice followed by President Nixon (pictured above, throwing out the first pitch at RFK Stadium on April 7, 1969). He’s flanked by a couple pretty good players too. But like Johnson, this wasn’t his first first pitch in an official capacity — he opened the 1959 season in Washington, throwing out the first pitch as Vice President. Nixon also threw out first pitches in Cincinnati (at Riverfront Stadium in 1970) and 1973 at Anaheim Stadium in California. Fun Fact: When Nixon threw out the first pitch as President at RFK Stadium in 1969, a typo in the presidential seal had apparently gone unnoticed — and uncorrected. By the time Ford became President in 1974 (after the resignation of Nixon), there was no more baseball being played in Washington D.C. — the original team moved to Minnesota and the second iteration of the Senators fled to Arlington, Texas — so Ford would not be able to continue the tradition of throwing an opening day pitch from the nation’s capital. He did still toss a first pitch in both Arlington and Philadelphia (for the ASG). Fun Fact: Ford also replicated Truman’s feat of throwing out both a left handed and right handed first pitch at the 1976 All Star Game, one to a representative from the National League (Johnny Bench) and the other to a representative from the American League (Thurman Munson). You can check that out here. OK, Jimmy Carter almost broke the tradition of throwing a Presidential first pitch — and in fact he never threw an Opening Day one. Additionally, that picture you see above is NOT one of him throwing a first pitch as President — the above photo is of him tossing out the ceremonial first pitch before Game One of the 1992 World Series between the Atlanta Braves and the Toronto Blue Jays at Fulton County Stadium on October 17, 1992 in Atlanta, Georgia (Carter was from Georgia). He did manage to throw out one first pitch as President — when he tossed the first ball before Game 7 of the 1979 World Series on October 17, 1979 (more on that here). Fun Fact: Carter wasn’t a baseball fan, but apparently he was a big softball fan. No photographic evidence of him exists throwing out a first softball pitch however. Fun Fact: Reagan may not have been a big baseball fan, but he was the first President to eschew throwing out a first pitch from the stands, actually throwing from the rubber at that Cubs/Pirates game. He would start a new tradition that has lasted to the present day. With his (somewhat) recent passing, much has been made of Bush (41) and his athletic prowess, so throwing out first pitches came naturally to him. In fact, today’s splash photo (Bush in a Mets jacket) was of him throwing out a first pitch at Shea Stadium on April 10, 1985. This may be the first pitch ever thrown by a President from the field of play rather than the stands, but since Bush wasn’t President at the time, that honor belongs to Reagan. As President and after Bush threw out a ton of first pitches, even as his health was failing. 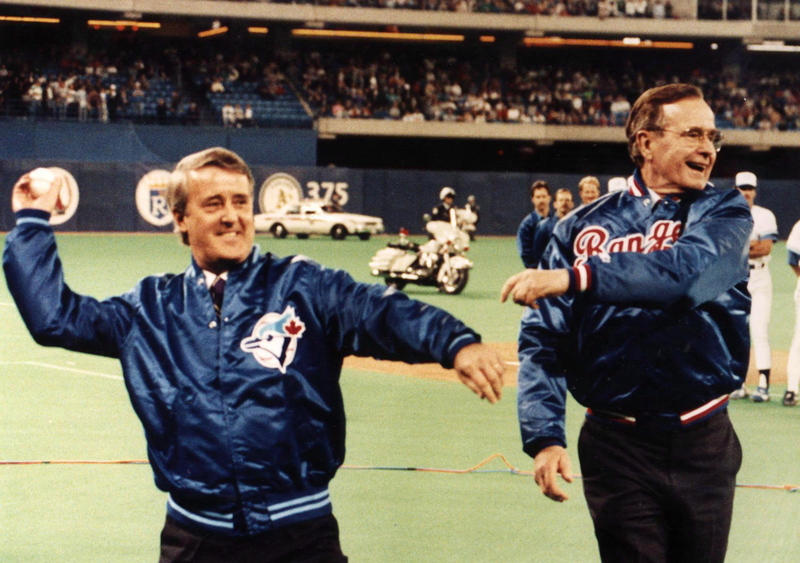 Fun Fact: President Bush became the first President to throw out an opening pitch outside of the United States, joining then-Prime Minister Brian Mulroney of Canada to toss out the first pitch on April 10, 1990. President Clinton threw three first pitches, including the 1993 Opening Day at Oriole Park at Camden Yards (picture above — April 4, 1993), and attended several other games as President, including the 1997 retirement of Jackie Robinson’s #42 (a game I attended), as well as Cal Ripken’s breaking of Lou Gehrig’s consecutive games played streak in 1995 (more here). Clinton also threw out the first pitch to open Jacobs Field in Cleveland in 1994. Fun Fact: While Clinton wasn’t the first President to throw from the mound (or field), he was the first to throw from the mound (barely) AND have it reach the catcher (more here), thus establishing yet another high-water mark for Presidential first pitches. Clinton may have only attended seven games, but there were some big ones he did get to! Bush 43 didn’t technically throw out the first pitch in 2001 in Milwaukee (pictured above) — then-Commissioner Bud Selig did — but Bush threw out the second pitch that opening day (April 6, 2001). He’d also throw out an additional six more first pitches (not all of them Opening Day) during his tenure as President (and more after his Presidency ended). Bush was also President when baseball returned to the nation’s capital, throwing out the first pitch there in 2008, opening up the new Nationals Ballpark. Fun Fact: Historians (and fans) may agree to disagree, but most would agree that Bush 43 threw out the greatest first pitch in history, during Game 3 of the 2001 World Series: A perfect strike, from the mound, wearing a flak jacket. President Obama only threw out two first pitches during his tenure, including Opening Day in 2010 in Washington (April 5, 2010). He may have engendered some disapproval due to his wearing a Nationals jacket but a Chicago White Sox cap. This was also (approximately) the 100th Anniversary of President Taft’s throwing of the first first pitch in 1910. That wasn’t President Obama’s first pitch (though it was his one and only opening day first pitch) — he also tossed out the first ball for the 2009 All Star Game in St. Louis (pictured above). He wore a Chicago White Sox jacket for that one. Fun Fact: So far, President Obama is the only sitting President to make a first pitch while wearing jeans and sneakers. 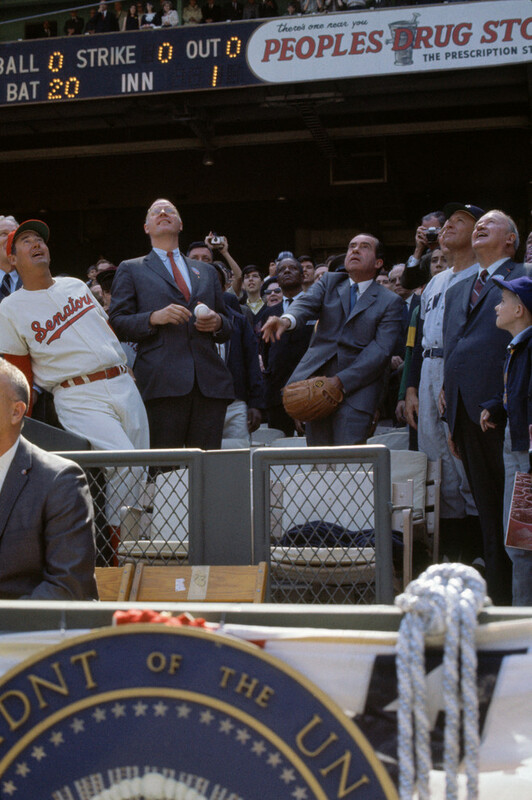 And there you have it — a somewhat brief history of Presidential first pitches. As mentioned in the lede, President Trump has still not thrown a first pitch as President. But he has thrown first pitches (as a civilian) before. Near as I can tell, he’s thrown at least three: including a July 9, 2000 game between the Cubs and White Sox, on March 12, 2004, before a spring training game between the Houston Astros and New York Yankees at Legends Field in Tampa, FL and on August 8, 2006 at a Yankees/Red Sox game at Fenway Park. Now, if he’d just do it as President, he’ll continue the tradition dating back to President Taft in 1910. It’s hard to imagine what it must have been like to visit Yankee Stadium on the day it opened in 1923. There’s that wonderful story about Babe Ruth, which may or may not be apocryphal, in which he’s seen taking a look at the green expanse for the first time and exclaims, “Some ball yard.” Whether true or not, the quote adequately describes what must have been a modern marvel to most people – the triple-decked stadium was billed as a one-of-a-kind facility. Painting Ruth, Meusel and his cohorts marching onto the field was something new, as I’d been so used to painting players doing, well, baseball stuff. One of the more challenging aspects of this painting was dealing with all of the signage in left field. Though very much a background element, it had to stay colorful and full of life. When it comes to stadium advertisements, I always try to lock down exactly what each sign looks like – what it says, what it’s advertising, and how it’s designed. And in this case, the original photograph didn’t necessarily yield those answers, as the marching players were clearly the most important feature of the image. Luckily, there is a ton of photography that was taken that cold April day, as well as throughout the season, so I was able to properly figure out what I was looking at through a lot of research. Of course, putting it all into color was a different story, especially considering the fact that we mostly think of players like Babe Ruth in black and white. That’s the way their images are always disseminated, whether it’s through home movie footage, newspapers or photography. Therefore, the world they inhabit must be no different, right? But it’s important to remember that green grass in 1923 was no different than that in 2019. The skies look the same. The sun still shines. People look the same. And now, like it was on April 18, 1923, it’s officially baseball season. My concept for the 2020 Browns rebrand. A return to simplicity and tradition with a redesigned elf logo, a lighter shade of brown, and a new script wordmark on the jerseys. The home and road uniforms can also be worn with orange pants. Thanks. OK readers, tweeters (and concepters). If you have some tweaks or concepts, shoot ’em my way with a brief description of your creation and I’ll run ’em here. Your local cable/satellite provider (if you still have one), is once again doing that free one-week preview thing. My buddy Jimmer Vilk almost always has to remind me of this (despite it occurring, like Saving/Standard time, semi-annually). Sometimes he e-mails me, sometimes he DMs me. This may be the first time he’s reminded me via tweet, though. Unfortunately, by reminding me about the free preview, he got me to check out the Marlins. Yeah, the black jersey has instantly risen to the top of the worst alternates in baseball. Instead of looking all cool and edgy, the wordmark on the jersey is almost impossible to read. The team wore home white jerseys on Thursday, so we hadn’t yet seen the black jerseys in action. And yes, the jerseys REALLY are that hard to read. NOB & back uni numbers are awful as well. Thanks Jimmer — so everyone — if you weren’t aware, here’s your reminder. From now through Thursday, you can watch all (out of market, I believe) games via your cable or satellite provider. Don’t thank me. Thank Jim. Especially if you happen to catch the Marlins in their black alt. 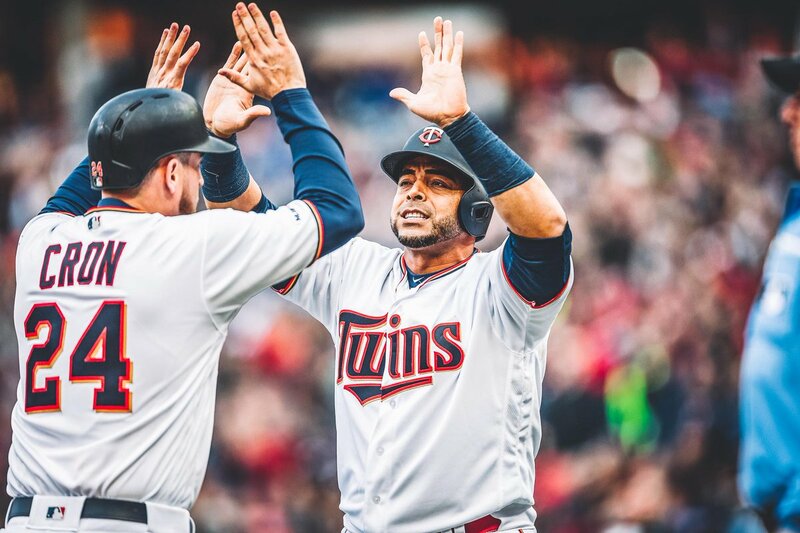 Baseball News: Tigers RHPs Joe Jiménez and Victor Alcántara both go FIOB despite no one else on the team having the surname “Jiménez” or “Alcántara”. Is this a “J.D. Martinez” type situation? … Twins RF Nelson Cruz wore a red belt during the home opener, and Sam Plohasz says it’s the first time he’s ever seen a Twin in a red belt. 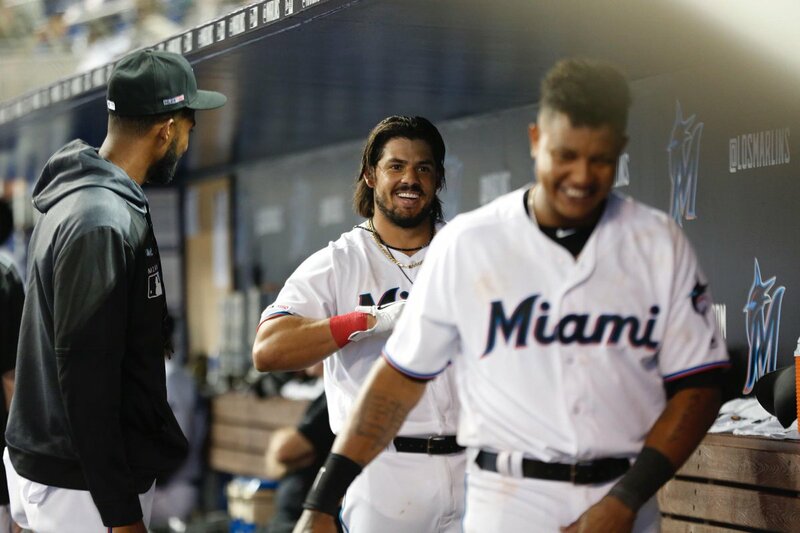 … The lettering on the Marlins’ new black unis is nigh-invisible under the lights (from @themikeyoulike). 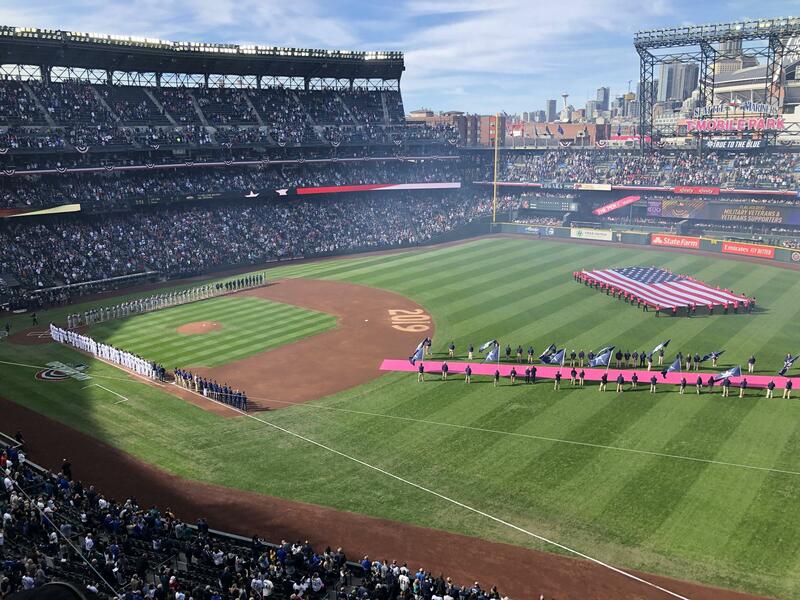 … Something we missed yesterday: as part of T-Mobile’s hostile takeover of the Mariners’ ballpark, the red carpet normally used during Opening Day player introductions was changed to magenta. Andy Vander Meulen and his friends booed it. 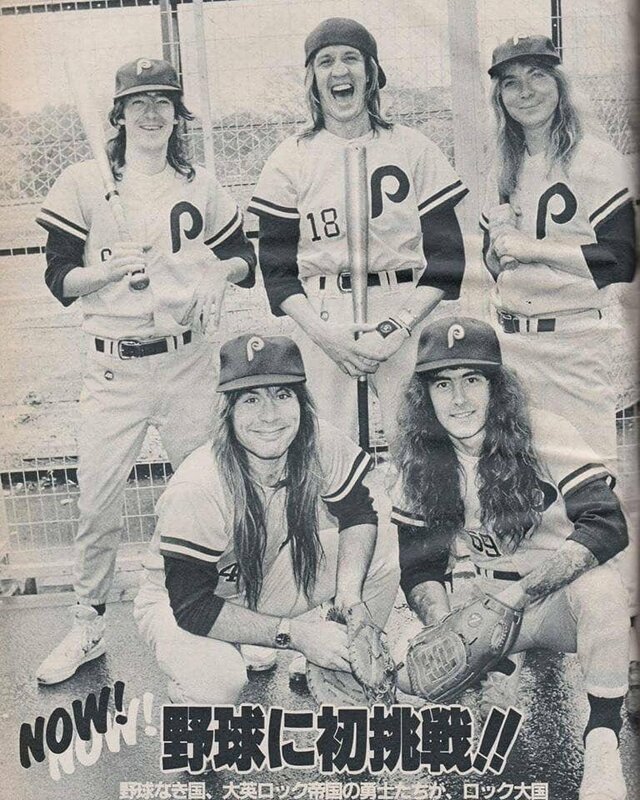 … Do you want to see Iron Maiden in Phillies unis? Of course you do! (thanks to @PhillyPartTwo for sending this our way). … Speaking of the Phillies and also posted in the NFL section: for some reason, the jumbotron at Citizens’ Bank Ballpark has a transition animation that is clearly a Dallas Cowboys logo. I’m sure that’s popular in Philly (from @light_beans). … @ThrowbackSports posted some classic IMPKO MLB logos c. 1970. … The Trenton Thunder, Double-A affiliates of the Yankees, are giving away rainbow caps for Pride Night on June 10 (from John Cerone). … The Fort Wayne Tin Caps, Single-A affiliates of the Padres, are wearing these bad boys for “Assistant to the Regional Manager Night” on June 28. As a diehard fan of The Office, I need to get myself to Fort Wayne in time for this game (from Dylan Herendeen). 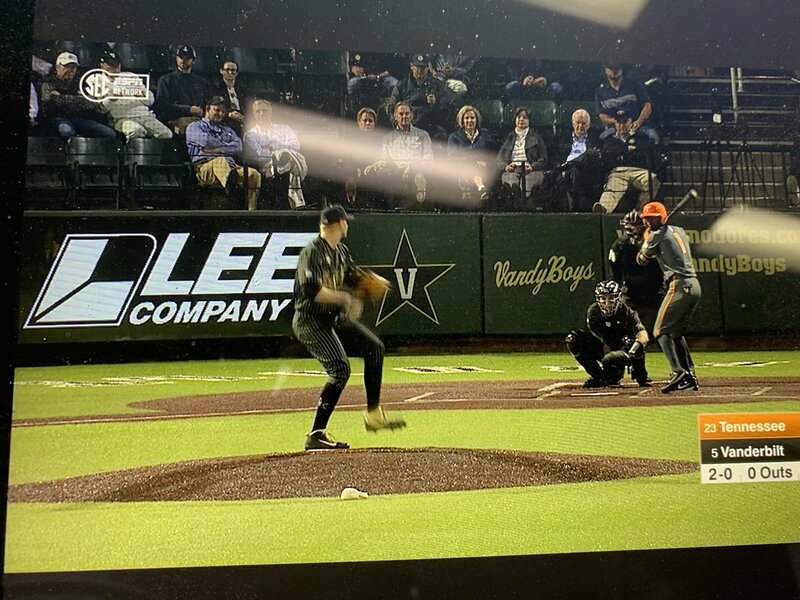 … Kendall Rogers says “I’ve never seen such a bizarre contrast of uniforms” as Vanderbilt wears its usual black-with-white-pinstripes and Tennessee goes with their GFGS set. … UCF have revealed new jerseys that have replaced their wordmark with a script. … Miss St. wore their special alternates to honor Alex Wilcox, former player who passed away from a battle with ovarian cancer last June. (from Griffin Smith). NFL/CFL News: The Vikings (and I assume every other NFL team?) will be wearing an NFL100 decal on the back of their helmets this season. … The Browns posted a uniform retrospective on their website. … Also posted in the hockey section: The ECHL’s Worcester Railers are going with Patriots-themed jerseys tonight, and honestly, they look good enough that a first glance I thought they were Patriots jerseys (from Lance Harris). … Cross-posted from the baseball section: for some reason, the jumbotron at Citizens’ Bank Ballpark has a transition animation that is clearly a Dallas Cowboys logo. I’m sure that’s popular in Philly (from @light_beans). … Would you like to own an Oilers-themed 1980 International Scout? Now is your chance (from Michael McLaughlin). College/High School Football News: Youngstown State’s unis for next season will look like this (from Robert Hayes). 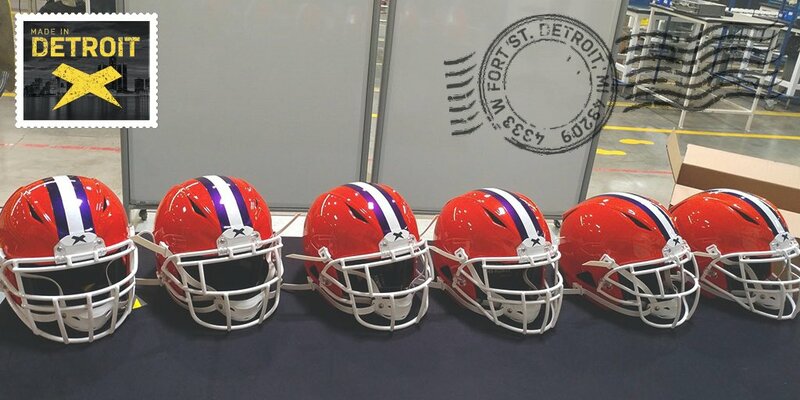 … It appears Clemson will be going with more metallic-looking striping for next season’s helmets (from Chad Fields). Hockey News: Also posted in the soccer section: USL Championship’s Phoenix Rising FC will wear Coyotes-inspired Kachina warm-up shirts on June 29 (thanks, Phil). 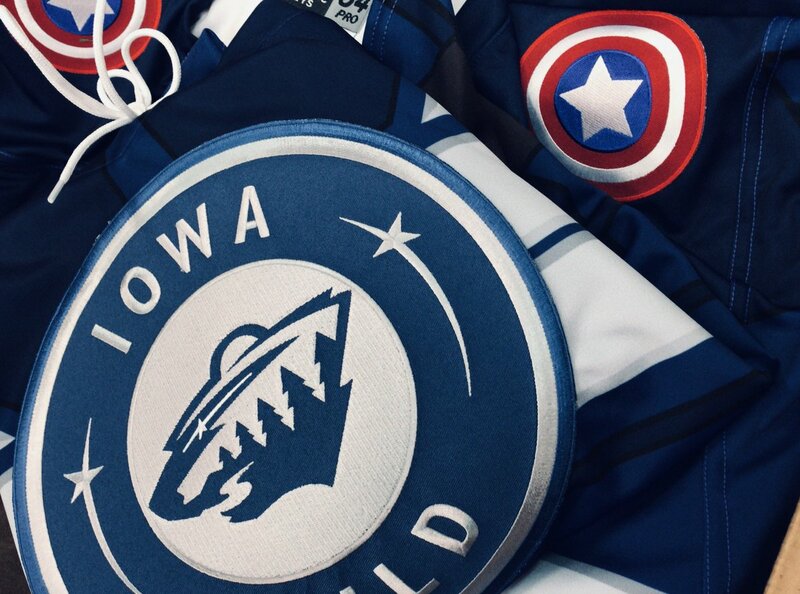 … The AHL’s Iowa Wild wore Captain America unis last night for Marvel Superheroes Night (from Sean Jankowski). 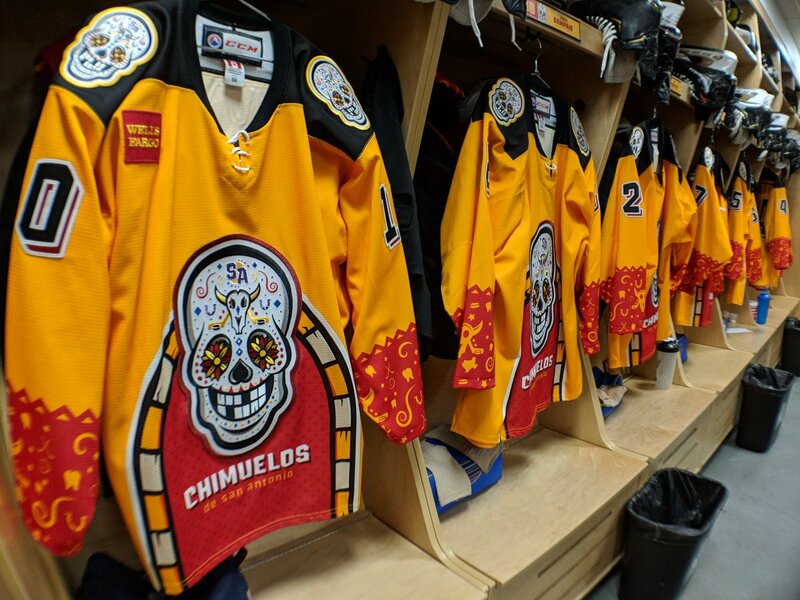 … The AHL’s San Antonio Rampage broke out their Chimuelos alternates for the final time this season last evening (from David Kemper). … Cross-posted from the NFL section: The ECHL’s Worcester Railers are going with Patriots-themed jerseys tonight, and honestly, they look good enough that a first glance I thought they were Patriots jerseys (from Lance Harris). NBA News: @70srejoin noticed that the number font on the Spurs’ retired number banners isn’t even close to matching the number font on the team’s actual jerseys. 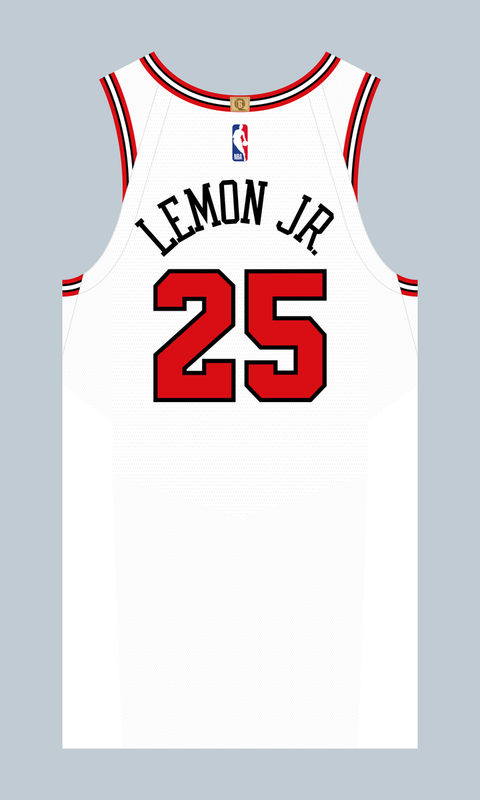 … PG Walt Lemon Jr. will wear No. 25 with the Bulls (from Etienne Catalan). 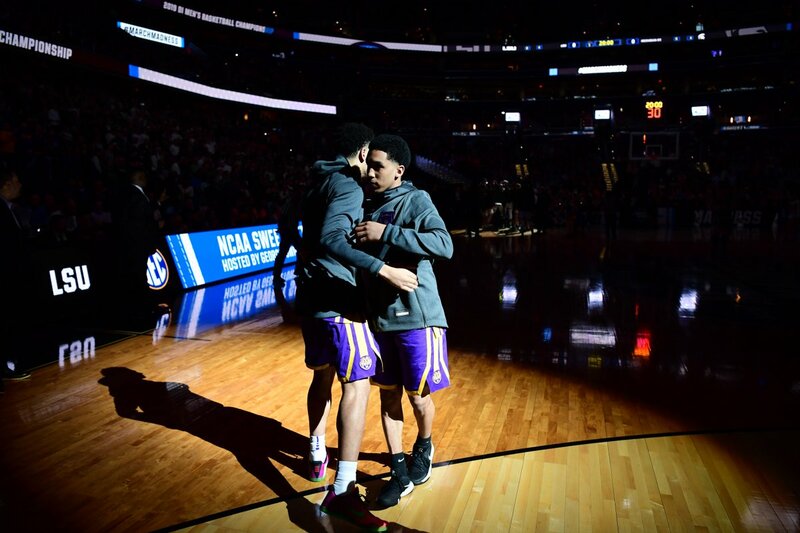 College/High School Hoops News: Some LSU players went with short-shorts during last night’s Sweet 16 game against Michigan State (from multiple readers). Speaking of LSU: An LSU fan reappropriated his Lakers jersey into an LSU one (from Brett Baker). … Bizarre-looking warm-ups for Virginia Tech last night, as the Hokies wore white compression tanks during shoot-around. 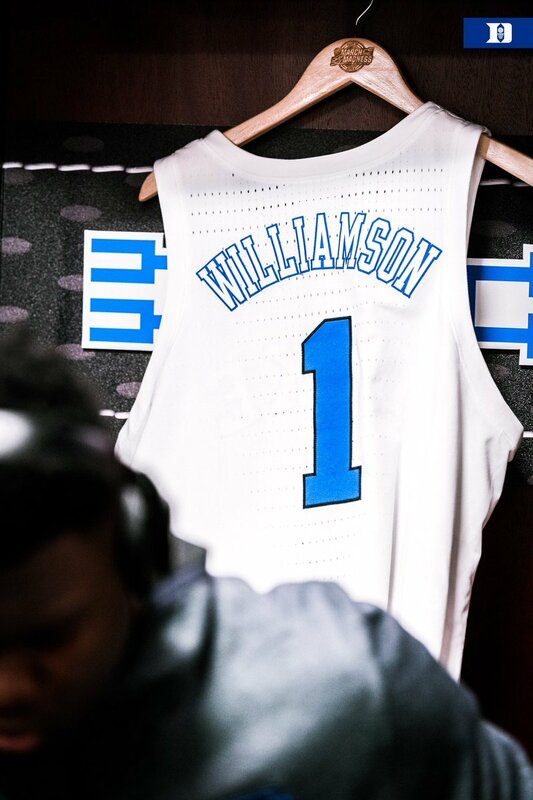 Duke wore their shooting shirts (from @bryanwdc). 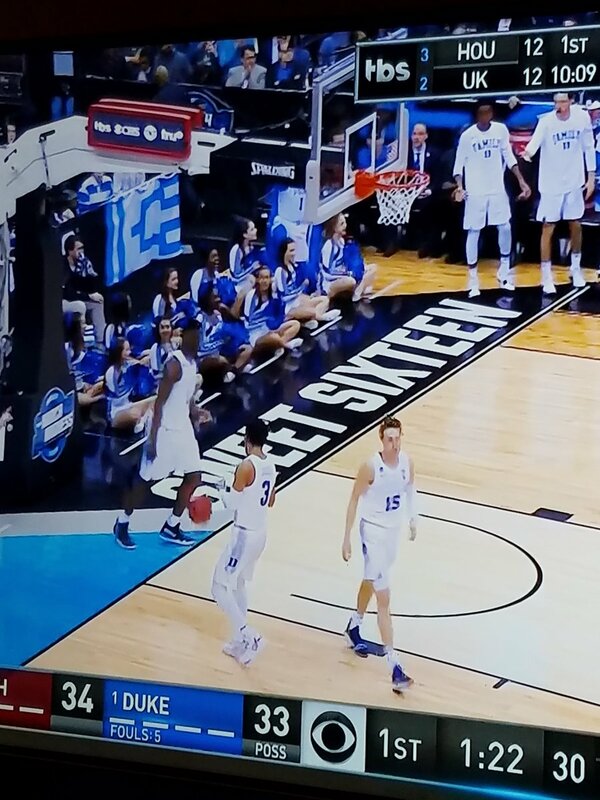 During the game, Duke went with their ghosted jerseys, which were hard to read (second pic from Chris Lather). … Not exactly uni-related, but evidently Colgate rented out Ohio State’s pep band for the Raiders’ Round of 64 game against Tennessee, even providing the Ohio State kids with Colgate gear — and Colgate actually has a pep band! (from Tony DiRubbo). … Auburn’s Chuma Okeke (#5), Bryce Brown (#2), and Malik Dunbar (#4) all lost their NCAA patches during Friday’s Sweet Sixteen game versus North Carolina (from Clint Richardson). Soccer News: FootyHeadlines and Manchester United fansite Full Time Devils have gotten their hands on what they think is next year’s United kit. 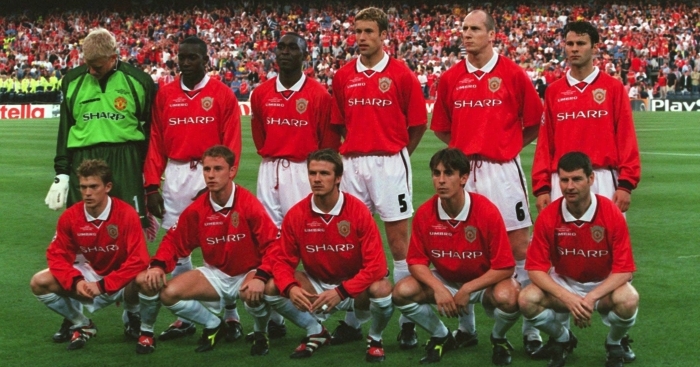 A clear call-back to the 1999 Champions League kits, the kit is extra-special now that the hero from that team, Ole Gunnar Solskjær, has become manager (from Charles George). 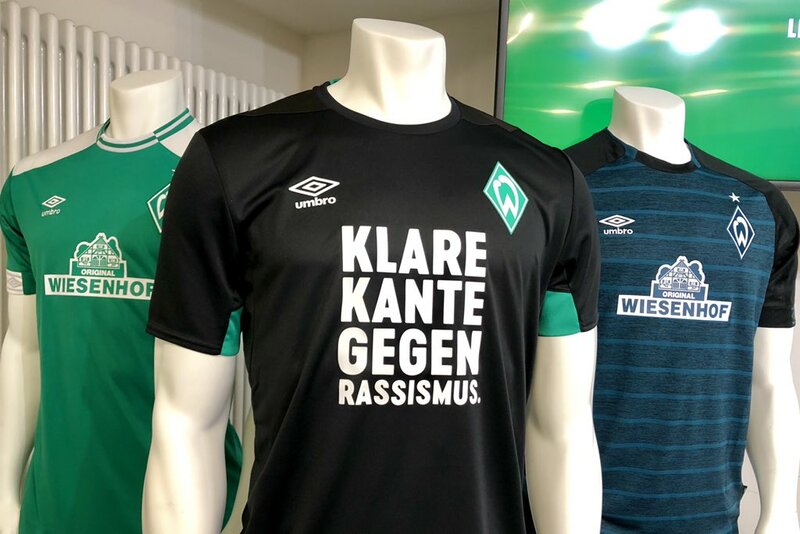 … German club Werder Bremen will wear prematch warm-up shirts with “A clear stance against racism” written on them instead of their advertiser (from Ed Żelaski). … The Portland Timbers posted a video on Twitter about all the work it takes to send an MLS team on the road (from Jeremy Brahm). 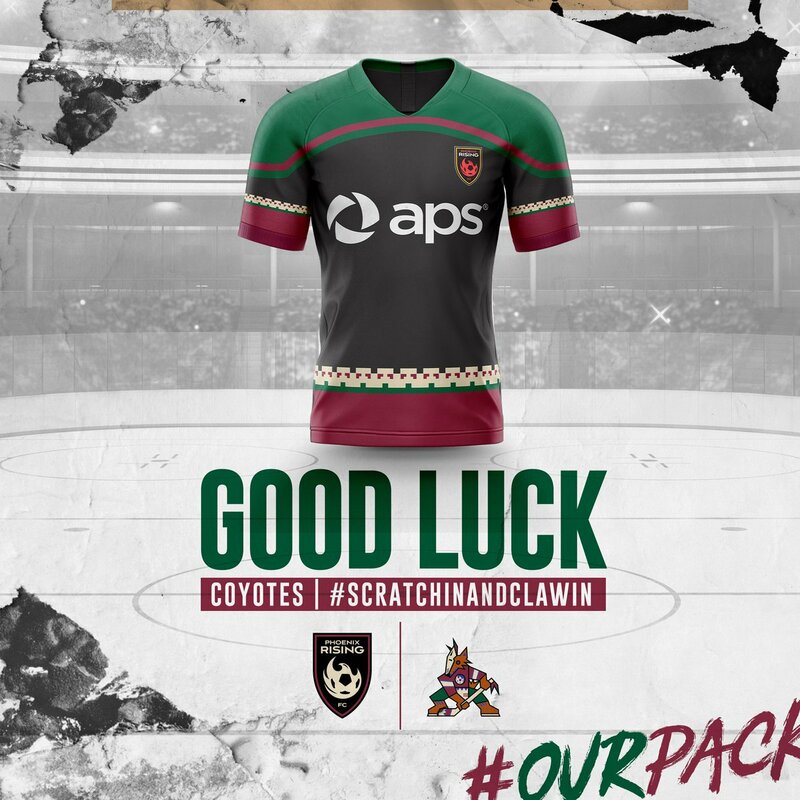 … Also posted in the soccer section: USL Championship’s Phoenix Rising FC will wear Coyotes-inspired Kachina warm-up shirts on June 29 (thanks, Phil). … USL League One side FC Tucson have launched their kits (from Justin Simmons). … Again from Phil: USL League One side North Texas SC has launched their inaugural kits. … Here are the Premier League kits for this weekend (from Josh Hinton). Grab Bag: Sign of the apocalypse: imprisoned drug lord Joaquín “El Chapo” Guzmán has sold the rights to his nickname to his ex-beauty queen wife in the hopes of starting a fashion line (from Jim Vilk). … Vox interviewed three design experts to deconstruct the logos of the (metric fuckton of) Presidential candidates (from @tonsoffun57). … United Airlines is pulling out of a naming-rights deal with the LA Memorial Coliseum, after critics called the potential move disrespectful to veterans (from @smithub and Forrest J. Bowlick). 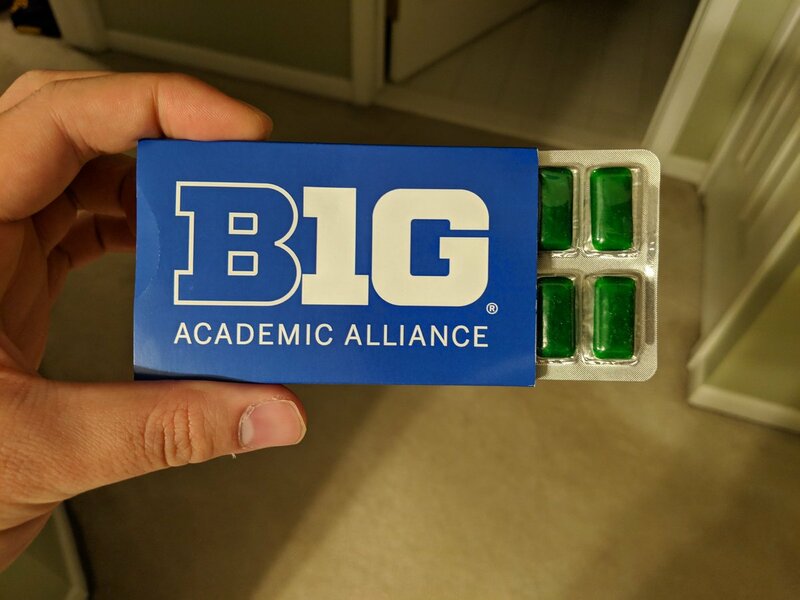 … The Big10 has an academic alliance with its own brand of gum (from Teddy Tran). … Saucony and Dunkin’ Donuts have collaborated to make a running shoe, and they’re already sold out (from John Cerone). … Speaking of weird retail/sporting goods crossovers, Puma has collaborated with Mattel to make a line of Barbie-themed workout apparel (from Jason Hillyer). Another baseball uni note: the Athletics added the elephant patch to their Friday alternate jersey. They only wore the 50th anniversary patch last season on that jersey. 1. The Spurs aren’t the only team to mismatch their retired banners with their uniform numbers. The Celtics and Sixers come to mind immediately. 2. The blue star at CBP refers to the blue stars on the Phillies’ wordmark. But the silver background is questionable and looks way too much like a Cowboys star. 3. Those Marlins black alt tops are illegible. Woof. Shoot, my pad crashed while I was typing this, so I thought it was lost, and then I typed the better version below. If anyone is moderating, I’d be grateful if this comment could be deleted. FDR’s record will never be broken without repealing the 22nd Amendment, but it can be tied. Under the 22nd Amendment, a vice president who succeeds to the presidency with less than 2 years left in the presidential term is still eligible to served two full terms thereafter. Since the presidential term begins on January 20, there’s a two-month window in which a vice president can take office, throw out two first pitches in the old term, and then win two full terms and throw out eight more first pitches. So say that a dark-horse ticket of LeBron James and Abby Wambach win the 2020 election. President James can throw out the first pitches of the 2021 and 2022 seasons, the former being a hastily arranged game in which both the Indians and the Angels play jointly against the Nats in Washington to goose attendance and ratings. Then President James resigns in February 2023 to accept a minor league contract with the Akron RubberDucks, leaving newly inaugurated President Wambach to throw out the first pitches in the 2023 and 2024 seasons. President Wambach would then be eligible to run for full four-year terms on her own in 2024 and 2028, so she could throw out eight more first pitches through the 2032 season, tying FDR’s record of ten. Reagan was a huge baseball fan. He was a baseball announcer early in his life and actually did some play by play with Vin Scully at the 1989 All-Star game. He called Bo Jackson’s home run in that game. The Cubs sent Reagan to Catalina Island in 1937 with the team for Spring Training (he did play by play for their radio affiliate in Des Moines). While there, he did a screen test with Warner Bros. By the time, he got back to Iowa, he had an offer waiting in the mailbox. I’m not sure where the idea that he wasn’t a huge fan came from, because much of the documented history on him would suggest otherwise. MLB players who met him spoke of his knowledge of the game’s history, often telling them things they themselves didn’t know about the game in the 1800s. Pres. G.W.H. Bush appears to be wearing a vintage first baseman’s mitt, perhaps the one he used while playing at Yale. The then-60-year-old GHW Bush also took the field at an Old-Timers’ Day while a sitting vice-president. That’s got to be some kind of record. He hit a single, and also knocked down a liner and got the assist. Fun fact, then-Senator Barack Obama threw out the first pitch before Game 2 of the 2005 ALCS between the White Sox and Angels. He did so wearing a white pinstriped Sox jersey and his signature cotton Sox cap. The Sox won 2-1 after AJ Pierzynski hustled out a supposedly dropped third strike. Tying the series up at 1-1. Reagan was the first president to throw out a first pitch from the field (in Baltimore), the first to throw from the mound (in Chicago), and the first to wear team clothing while throwing a first pitch. Our modern idea of the presidential first pitch? 100% Gipper. I attended one presidential first pitch, George W. Bush at Nats Park opening day in 2008, and I was sorely disappointed by the ubiquity of fan booing. I mean, I get it, Bush the Lesser was a terrible president, but the president has two jobs: ceremonial head of state, and political chief executive of the government. 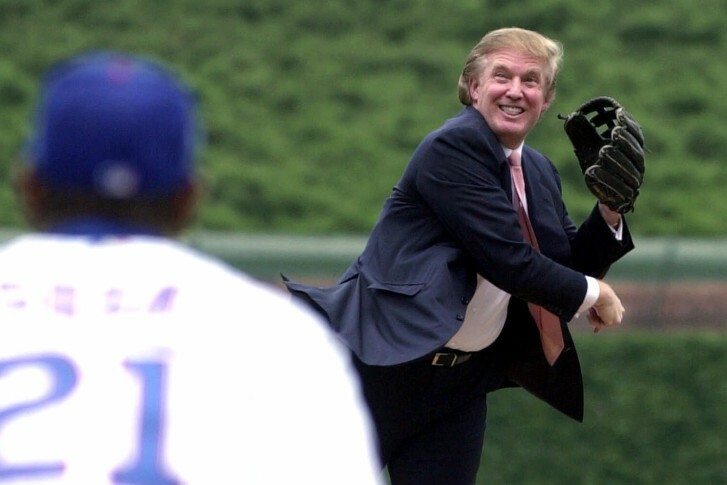 When throwing out the first pitch at a ballgame, the president acts in his ceremonial role, not his political or policy role. When you boo the president acting in the ceremonial capacity, you’re booing the United States, not the individual politician who happens to hold the office at the moment. Bad form. But golf was on his mind for his first home opener in 1953 (pictured above): he was playing golf at Augusta that day! But the game ended up being rained out, and he threw the first pitch at the made up game (April 16, 1953). They actually created an imaginary game? How about two former presidents throwing out the first pitch? Before Game 4 of the 2011 World Series, former Presidents George H W Bush and George W Bush threw out the first pitch in Arlington. W remains a frequent and popular visitor to Rangers’ games. He attended Opening Day this year, though did not throw out the first pitch (sitting Governor Abbott had the honor). Short shorts? Hardly! When they don’t extend beyond mid-thigh, THEN you can call them short- shorts. And you kids get off my lawn. Did the Prime Minister of Canada ever do this to start the MLB season in Toronto or Montreal? The Phillies have never worn those uniforms. Some group appropriated the iconic P and stick it on some generic gear. I’m surprised the jerseys didn’t have 666 on the back. I’m always interested in the backgrounds while the dignitaries threw out first pitches. It looks like some guys were still wearing jackets and ties to baseball games up to the late sixties, but that was changing by the mid seventies, at least in the lower levels. When I went to ball games with my Dad in the mid-sixties, nobody wore jackets and ties in the cheap seats (we sat in the left-field pavilion at Dodgers Stadium). HMS is the prefix for British naval vessels; His/Her Majesty’s Ship. RMS is the prefix for ocean liners, i.e., merchant ships that carry mail across the Atlantic; Royal Mail Ship (or Royal Mail Steamer). There was never an HMS Titanic. Obama threw like a girl. Great write up on Presidential first pitches. I find it interesting while watching the clips that in each case the announcer just refers to “The President of the United States” without their actual name. So now I have to wonder if that’s standard procedure at most events? Like saying “here’s a man who needs no introduction….” and leaving it at that.